jb capacitor for audio application was getting abundant, our brand was praise and promoted in audio manufacturer industry. There are several series that we can produce. We can offer plastic film cap-Axial & aluminum E-cap and aluminum Foil and film cap. It can be used in loud speaker an Cross-Over Networks, audio converters and automotive electronics products. we can offer wide capacitance range. Some special values also can be made upon on request. welcome to visit our website page specially for audio capacitors. You can easier to find products that you need. Leakage current (Φ4~Φ8x6.2) ≤0.01CV or 3μA, whichever is greater. Specialized in manufacturing full series of Plastic Film Capacitors & Snap-in, Screw & Lug type Aluminum Electrolytic Capacitors. These products have been widely using in consumer's electronics, data processing, telecommunication, and industrial control's equipments. It is our commitment to offer our customers the best quality products with fast delivery and the best after sales services. 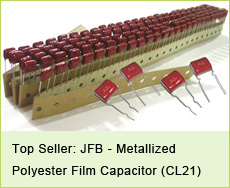 jb Capacitors has been producing film capacitors since 1980. We offer all kinds of film capacitors, polyester, polypropylene, polystyrene, epoxy dipped type, box type, X2, X1 class, high voltage film capacitors up to 2000VDC, besides winding technology and stacked technology are both available. 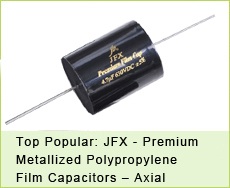 Our film capacitors are famous for high quality, short lead time and very competitive prices. jb Capacitors produces many kinds of motor starting capacitors, with high safety, high reliability, low dissipation factor and low temperature rise. jb Capacitors has 30 years production experience on large can (snap in, screw, and lug type) aluminum electrolytic capacitors. We sell top quality with reasonable prices. Our SMD aluminum electrolytic capacitors 105'C and 85'C lead time is very short and prices are the best in the market. Monthly output for SMD electrolytic capacitors can meet 30 millions.